Mateusz Klich, aims a pass for Leeds United in their FA Cup defeat at Newport County. Picture James Hardisty. Leeds United’s seemingly annual FA Cup embarrassment came early and at a potentially big cost as they lost 2-1 at Newport County. After losing to Sutton United in their last FA Cup outing when Liam Cooper was sent-off lightning struck twice for the Whites with this time Samuel Saiz red carded after being accused of spitting late on in the third round tie. He is now likely to miss the next three games and ironically head coach Thomas Christiansen protected most of his first team stars after making nine changes to the team that started the previous league game. Why he chose to put Saiz on in the 75th minute when Leeds were 1-0 up was strange and it backfired horribly with Newport turning the game round late on and the Spanish playmaker ordered off for the alleged spitting in the aftermath of the Welsh club’s winner. Leeds had looked comfortable after riding their luck in the first half to lead through Gaetano Berardi’s first-ever goal, but an own goal from Conor Shaughnessy gave the hosts hope of a cup win and their top scorer, Shawn McCoulsky, scored the winner in the last minute of normal time. The clincher came from a corner and could be no surprise after Newport looked threatening from just about every set piece and the many long throws they launched into the United box. The much changed defensive line-up struggled at times, although Berardi did put up a promising display after being handed a surprise selection at centre-back before being switched to left-back after Cameron Borthwick-Jackson picked up a knock. Christiansen pulled another surprise out of the hat by changing formation to 4-4-2 for the first time with Pierre-Michel Lasogga and Jay-Roy Grot up front. It almost paid off in the opening 10 seconds when a long ball from the kick-off led to Grot going through one-on-one with home keeper Joe Day, but a weak finish by the struggling young Dutch striker made the save easy enough for the onrushing Newport stopper. Newport’s first threat saw Joss Labadie head wide when unmarked following the first long throw launched into the box. Leeds were ahead on nine minutes when a clearance fell to Berardi at least 30 yards from goal. He let fly and his swerving low shot beat Day to spark wild celebrations at a first career goal for the popular defender. Mateusz Klich was in the right place to prevent a Newport equaliser as he cleared Padraig Amond’s close range shot off the line and another home threat came to nothing as Labadie’s weak header was easily saved by Andy Lonergan. Vurnon Anita’s shot from distance was saved by Day before Labadie saw a shot well blocked by Berardi at the other end. Amond then fired a far post volley over and Robbie Willmott hit an angled volley over while United’s Pawel Cibicki hit a 35-yard free-kick that took a deflection and was easily saved by Day. The second half started promisingly for the visitors with Lasogga heading wide from a Cibicki cross, but Newport remained a threat as Amond sent an overhead kick over after a cross had not been dealt with. Grot shot over from the edge of the box after turning well and it was beginning to look comfortable for Leeds, for who Lasogga brought another save out of Day from the edge of the box. Newport sent on top scorer McCoulsky from the bench and he shot over after cutting in from the left flank. It was out of the blue when they equalised on 76 minutes, Frank Nouble’s low cross being sliced into his own net by Shaughnessy. But it was one-way traffic from that point with Leeds looking to hold on to earn a replay. Labadie shot wide from the edge of the box, Amond’s header was comfortably saved by Lonergan and substitute Paul Hayes fired over with his second touch after turning smartly. The pressure was maintained and from a corner McCoulsky got above Kalvin Phillips to head home what proved the winner. In the aftermath of wild celebrations Saiz was red carded and McCoulsky booked, both seemingly on the word of a linesman and Leeds’ misery was complete on another FA Cup day to forget. 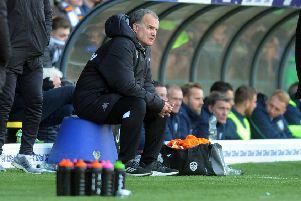 Head coach Christiansen shouldered the blame for the defeat and apologised to fans who travelled, although he defended his decision to make so many changes. He said: “I am very disappointed. It’s a team that should still win. “It doesn’t matter if there were many changes. If you name them one by one they are players that play in the first 11 that should beat a team from league Two. On Saiz’s sending off, Christiansen added: “I don’t know, I didn’t see it. “I don’t know, when I know I will come back. Newport: Day, Pipe, White, Demetriou, Butler, Willmott, Dolan (McCoulsky 69), Labadie, Bennett, Nouble, Amond (Hayes 86). Leeds: Lonergan, Anita, Shaughnessy, Berardi. Borthwick-Jackson (Cooper 60), Sacko, Klich, Phillips, Cibicki, Lasogga, Grot (Saiz 75, sent-off 90).